The motto for the City of Saraland is “Gateway to Progress.” Through careful planning and cooperation, we strive to protect the quality of life for our residents and visitors while maintaining positive support from our businesses and developments. Gateways are for walking through but we’re certain when you see Saraland, you’ll want to stay. The Land Use and Development Ordinance is an updated compilation of previously adopted regulations. 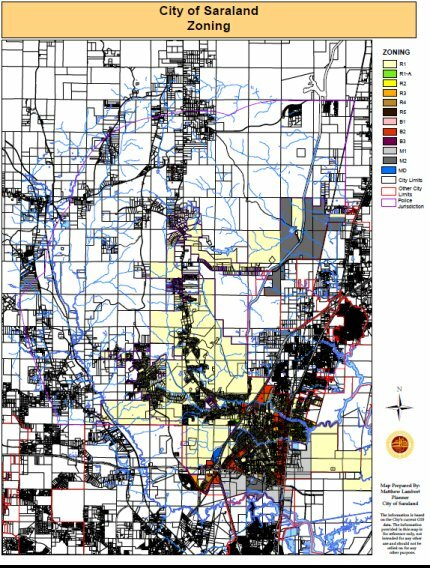 The Planning Commission and Board of Adjustments are tasked with the responsibility of interpreting the City’s plans and ordinances concerning land use and growth. The Saraland Planning Commission meets the second Tuesday of each month in the Saraland Municipal Courtroom. The meetings begin at 6:00 p.m. and are open to the public. Due to lack of quorum to consider a vote on the Preliminary/Final Subdivision Plat of Saraland Crossings Subdivision, Resubdivision of Lot 2, at the 03-12-2019 Regular Meeting of the Saraland Planning Commission, a Special Called Meeting has been scheduled for Tuesday, March 19, 2019. The special called session will convene at 6:00 P.M. in the Municipal Courtroom. There will not be a pre-meeting in the Chamber of Commerce meeting room. The Saraland Board of Adjustment meets on the first Tuesday of each month in the Saraland Municipal Courtroom. The meetings begin at 5:30 p.m. and are open to the public. Applications and requests for the Planning Commission or the Board of Adjustment are due 30 days prior to the Boards scheduled meeting. Applications should be returned to the Building Department at 933 Saraland Boulevard South, Saraland, AL 36571. For additional information, you may call the Building Department at 679-5502. The City of Saraland’s Sign Ordinance can be found in Article 33 of the Saraland Land Use & Development Ordinance. No Sign Will Be Allowed In The Right-of-Way. If a legally nonconforming sign is structurally altered, abandoned, discontinued, relocated or replaced, including the result of an act of God, the sign shall immediately lose its legal nonconforming status and must come into conformance with the Ordinance. What is the Sign Ordinance? The Sign Ordinance regulates size, type, number, and location of signs available to each property. This helps to prevent hazards to traffic, minimize effects on nearby properties, and encourage a positive visual environment. The Sign Ordinance can be found in Article 33 of The City of Saraland Land Use and Development Ordinance. Is my sign in compliance with the Ordinance? In order to determine the answer, follow the worksheet located here. Check the Saraland Zoning Map (click on the map below) or you may request a Zoning Verification Letter from the Building Department. Please verify all information with the Department before making any business decisions. Check the Saraland Zoning Map online or you may make a request Zoning Verification Letter from the Building Department. Please verify all information with the Department before making any business decisions. 2. Is my property located in the Saraland School District? Only property located within the City of Saraland is in the Saraland School District. To verify whether you are inside or outside of the city limits, check the Saraland Zoning Map online . 3. How do I annex my property into the city limits? In order to be eligible to annex into the city limits, your property must touch another piece of property that is already in the city limits, creating a “domino effect”. Once this occurs, you may submit an Annexation Application, along with a copy of your deed, to the Building Department. These documents will be reviewed by the Planning Commission, a public hearing will be held, and the annexation will be voted on by the City Council. Check the Saraland Zoning Map to see if your property touches the city limits. 4. Is my property located within the City’s Planning Jurisdiction? The City’s Planning Jurisdiction extends three miles beyond the city limits. To determine if a specific piece of property is located within the Planning Jurisdiction, check the Zoning Map. 5. How close may I build to my property line? It depends on what your property is zoned and where it is located. In general, for lots which are in a neighborhood, are zoned R1, and are not on a corner, you can build as close as 35’ to your front and rear property lines and as close as 10’ to your side property line. For corner lots or other zoning districts, call the Building Department for setbacks. 6. If my property is in the Planning Jurisdiction, am I required to go before the Planning Commission in order to subdivide the property? Yes. The Planning Commission must approve the subdivision plat. 7. I think my neighbor’s structure is too close to the property line/they’re operating a business out of their home, what can I do? Call the City of Saraland Building Department, 251-679-5502. Home Occupation Business is an occupation for gain or support that is conducted only by members of a family living in a dwelling. It is allowed in residentially zoned areas, but must be approved by the City Planner. Limitations are listed in Article XXXI of The City of Saraland Land Use and Development Ordinance. City Hall can be contacted for the required licenses. 9. How do I submit an application to the Board of Adjustment? Contact the Building Department to verify that you do in fact need to go before the Board. All applications and fees will then be submitted to the Building Department, and your project will be placed on the agenda for the Board of Adjustment. Applications are on the left side of this page. 10. How do I submit an application to the Saraland Planning Commission? Contact the Building Department to verify that you do in fact need to go before the Planning Commission. All applications and fees will then be submitted to the Building Department, and your project will be placed on the agenda for the Planning Commission. Applications may be found on the left side of this page. 11. What are the meeting and deadline dates for the Board of Zoning Adjustments and Planning Commission? The Board of Adjustments meets on the first Tuesday night of every month at 5:30 p.m. in the Saraland Municipal Complex Courtroom located at 937 Saraland Blvd. South. In order to be on the agenda for the Board of Adjustments, all paperwork must be submitted thirty (30) days prior to the meeting date. The Planning Commission meets on the second Tuesday night of every month at 6:00 p.m. in the Saraland Municipal Complex Courtroom located at 937 Saraland Blvd. South. In order to be on the agenda for the Planning Commission, all paperwork must be submitted thirty (30) days prior to the meeting date. 12. What are the Subdivision Regulations? Subdivisions are usually the first step in the development of growth, which is a big concern to the City in terms of providing adequate services. Subdivision regulations are found within the Land Use & Development Ordinance. The Planning Commission will determine if the minimum requirements (i.e. size of lot, proper access, etc.) are met before approving the subdivision. In addition to reviewing these applications within the city limits, the Commission’s jurisdiction extends three miles beyond the city limits to what is known as the Extraterritorial State Planners Jurisdiction. The State allows the extension because again, the City of Saraland must be prepared to provide services as the city grows. 13. What is the Landscaping Ordinance? In an effort to enhance the aesthetic and economic value of the city, Saraland enacted a Landscaping Ordinance. These regulations require that all new projects, marginal use change projects, and properties with changes in ownership comply with the Landscape Ordinance. The Ordinance can be found in Article XIX of The City of Saraland Land Use and Development Ordinance. 14. What are the top 10 common oversights that result in Plan review Unresolved Issues? 15. What is the key to success? Accurately review checklists to ensure that you have included all documents, fees and plan requirements. Incomplete plans may be returned without a review. 16. Where do I submit my plans and permit applications? 17. What fees are involved and when do I pay them? The Fee Schedule may be found in Article XXXIV of The City of Saraland Land Use and Development Ordinance. Fees may be paid to the Building Department when plans and applications are submitted. 18. Who do I make my check out to? Checks should be made out to The City of Saraland. Cash and credit cards are accepted. 19. Where can I find additional information? City of Saraland Building Department, 251-679-5502.